The WhiteKnightTwo/SpaceShipTwo launch system is showcased during opening day ceremonies of the Final Assembly, Integration and Test Hangar. The Spaceship Company is ramping up its ability to produce both suborbital rocket ships and flying launch platforms. In a grand and ceremonious style, a factory site that will crank out private spaceships has opened its hangar doors. The $8 million hangar was specifically designed to support the final stages of assembly and integration for prime customer Virgin Galactic’s fleet of passenger-carrying suborbital SpaceShipTwos and the mothership launch craft, WhiteKnightTwos. "The opening of the new facility is an important step on a journey that will culminate in commercial operations at Spaceport America" in New Mexico, said George Whitesides, CEO and president of Virgin Galactic, which will launch paying customers to suborbital space aboard SpaceShipTwo. "The modern plant is energy-efficient and will provide ample space for future growth of The Spaceship Company. It can hold two WhiteKnightTwo carrier aircraft and several SpaceshipTwos at the same time," Whitesides told SPACE.com. The Spaceship Company (TSC) was established to manufacture additional vehicle sets beyond the first pair from Scaled Composites. "We believe there is tremendous possibility for growth in the future," Whitesides added. FAITH is a 68,000-square-foot (6,317 square meters) structure. It's big enough to accommodate the first-ever side-by-side public viewing of WhiteKnightTwo/SpaceShipTwo and the WhiteKnightOne/SpaceShipOne system, which happened at the grand opening ceremony. In 2004, SpaceShipOne bagged the $10 million Ansari X Prize as the world’s first privately developed piloted spacecraft. Onlookers take part in Sept. 19, 2011 ceremonies at the Mojave Air and Space Port. The Final Assembly, Integration and Test Hangar is designed to put together spaceships for Virgin Galactic. 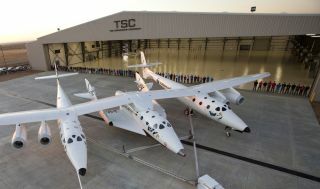 TSC is the aerospace production joint venture of Sir Richard Branson’s Virgin Galactic and Scaled Composites, which teamed up to build the world’s first fleet of commercial spaceships and flying launch pads. During the flight, space travelers are promised astounding views of the planet from the black sky of space for about 1,000 miles (1,609 kilometers) in every direction. In the space reservation department, Virgin Galactic has signed up more than 450 individuals who have made deposits between $20,000 and the total per-seat cost of $200,000. Total deposits received are over $57 million. Over 85,000 people from 125 countries have registered their interest in becoming a Virgin Galactic astronaut, according to the company. The first fully built SpaceShipTwo is dubbed VSS Enterprise, and the WhiteKnightTwo is called VMS Eve. Both have already undergone a step-by-step test flight program. Still ahead, however, are critical flights involving SpaceShipTwo’s hybrid rocket motor. That engine is central to giving the craft a kick-in-the-pants velocity to attain a desired suborbital trajectory. The progression of shake-out flights is necessary before Virgin Galactic can start safe and sound commercial operations, which will be based at Spaceport America in New Mexico. FAITH was completed within 10 months, as scheduled and on budget by Bakersfield-based Wallace & Smith General Contractors. It can support the production of two WhiteKnightTwos and at least two SpaceShipTwo vehicles in parallel. Also, the facility can support major return-to-base maintenance for the rocket plane and carrier mothership fleet once in operation, officials said. Virgin Galactic's SpaceShipTwo private spaceliner flies over San Francisco's Bay Area Bridge with the city as a backdrop while en route to San Francisco International Airport with the Virgin America aircraft "My Other Ride is a Spaceship" to open a new terminal at San Francisco International Airport on April 6, 2011. FAITH is one of two facilities that TSC will use to produce commercial spacecraft. The other is a 48,000-square-foot (4,459 square meters) existing building at the Mojave Air and Space Port that TSC recently upgraded to serve as the company’s fabrication and vehicle sub-assembly facility. TSC has secured options to expand the size of the FAITH facility and build an adjacent flight test hangar, as the customer base grows. The opening of FAITH has been also billed as a means to boost local economies in California and New Mexico. TSC currently employs more than 80 people and is looking to double its work force within the next year, with numerous high-tech and engineering positions available in the next few months, according to TSC officials. Others in the aerospace field see the opening of the new hangar as a good sign for the nascent space tourism industry. "Not only are we welcoming a new neighbor at the Mojave Air and Space Port…we’re ushering in another phase in the development of commercial space travel," said Doug Shane, president of Scaled Composites. "It’s exciting to see the vision becoming a reality."